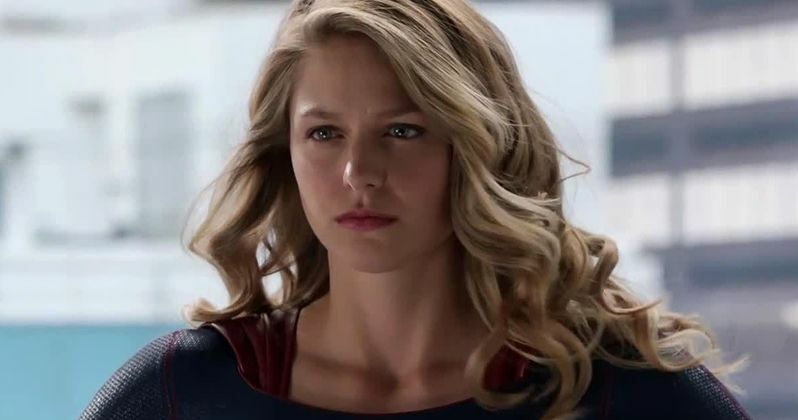 With just a few weeks left until Supergirl returns for Season 3 on Monday, October 9, The CW has released a brand new trailer, which teases Kara Zor-El (Melissa Benoist) and her "hero's journey." It's been quite some time since we've seen any footage, with the last trailer coming during Comic-Con, when The CW confirmed that the new villain this season will be Reign, played by Odette Annable. Aside from the DC Worldkiller, there will be a number of other new characters introduced, although we don't get to see these characters in the trailer. We do, however, get a glimpse at the massive Supergirl statue that is put up in National City to honor this hero. The trailer, which debuted on The CW YouTube, indicates that Kara might be questioning her journey, since we see characters like J'onn J'onzz (David Harewood) and her sister Alex (Chyler Leigh) trying to motivate Kara. Unfortunately, this trailer doesn't give us our first look at the new Alura Zor-El yet. Smallville veteran Erica Durance took over the Alura role this summer since Laura Benanti had to back out due to her commitments to Broadway productions. Still, with the the premiere exactly two weeks away, it's possible we may see more footage that features the new Alura Zor-El in. the near future. Among the other new characters this season are Adrian Pasdar, who has come aboard to play Morgan Edge, described as, "a ruthless real estate developer who will stop at nothing to get what he wants (and what he feels he deserves)". The DC villain's big plans for National City instantly put him at odds with Supergirl (Melissa Benoist) and Lena Luthor (Katie McGrath). Carl Lumbly has come aboard to portray M'yrnn J'onzz, the father of J'onn J'onnz, described as, "a pacifist religious leader on Mars, M'yrn pushes his son in unexpected ways." Yael Grobglas portrays DC character Psi, described as, "a psychic villain who uses people's own minds against them," whose meeting with the Girl Of Steel "affects her in surprising ways." The last new cast member is Emma Tremblay, who plays Ruby, a smart, independently minded National City kid who's fascinated by Supergirl and ends up in jeopardy because of it. The Supergirl cast also includes Calista Flockhart as Cat Grant, Chris Wood as Mon-El, Floriana Lima as Maggie Sawyer, Jeremy Jordan as Winslow "Winn" Schott, Jr. and Mehcad Brooks as James Olsen. Based on characters created by Jerry Siegel and Joe Shuster, Supergirl is from Berlanti Productions in association with Warner Bros. Television, with executive producers Greg Berlanti (The Flash, Arrow), Andrew Kreisberg (The Flash, Arrow), Sarah Schechter (Arrow, The Flash), Robert Rovner (Private Practice, Dallas) and Jessica Queller (Gilmore Girls, Gossip Girl, Felicity). Supergirl will also be part of The CW Network's massive crossover this year, which seems to be bigger than any of the crossovers thus far. The CW announced last week that this year's four-part crossover will be called Crisis on Earth-X, which air on Monday, November 27 and Tuesday, November 28. It has also been confirmed that Russell Tovey will portray the DC Comics character The Ray, who hails from Earth-X. The story is said to center on the wedding of Barry Allen (Grant Gustin) and Iris West (Candice Patton), with all of the Arrowverse character gathering for the wedding, when a group of villains from Earth-X arrive to disrupt the festivities. While we wait for more on the crossover, take a look at the Supergirl Season 3 trailer below.